Small Business Online Banking & Bill Pay is a secure service that allows your company instant access to all of your Planters Bank accounts. Enjoy the convenience of banking on your own schedule from any location with a computer and internet connection. Passwords, multi-layered authentication and encryption technology keep your account information private and secure. Stop by any Planters Bank office today and sign up for Business Online Banking and Bill Pay. Click the icons below for a tour of our online business banking products and services. 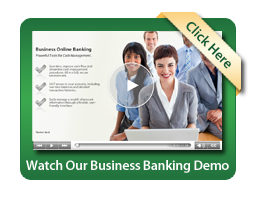 Planters Corporate Online Banking is a complete and powerful Treasury Management tool that offers high-volume transaction businesses flexibility to maximize cash flow. We have the technology and the expertise that can help you improve efficiency and reduce expenses in managing your company's cash. Experience greater convenience and easier record keeping when you receive your monthly statement electronically. Available with any business banking account. Planters Visa® Business Check Card with U-Choose RewardsSM – Worldwide acceptance means your Check Card can be used at millions of locations throughout the world. Get cash and account information from any ATM nationwide displaying the Cirrus and Pulse logos. Plus, all of your check card transactions are shown on your monthly checking account statement. Use your check card anywhere Visa® is accepted and earn U-Choose RewardsSM points with every signature-based card transaction. Avoid the hassles of writing checks and accumulate points redeemable for travel and merchandise. You shop. You earn. You choose. It’s that simple. Say goodbye to waiting forever to earn enough points to redeem. Visit www.uchooserewards.com to register. You’ll also find a detailed list of where you’ve shopped and what you’ve earned, an online catalog of redemption options, a Wish List, and much more! * Visa® Check Card and VISA® Check Card with Photo Security is subject to approval. Planters ATM Banking – Day or night you'll have access to your cash or account information. Even if you are out of town, out of state, or out of the country, you can get the cash you need at any ATM displaying the Cirrus and Pulse logos. Click here for Planters Bank ATM Locations. There may be a fee for using non-Planters Bank ATMs. ** Visa® Credit Card is subject to approval. Planters Telephone Banking – Planters Telephone Banking is available 24 hours a day, seven days a week from any touch-tone telephone. You can check your account balances for checking, savings and loan accounts, make account transfers between your accounts, and access product information from the convenience of your by calling toll free 877-792-4078. Wire Transfers – When sending a check or giving cash are not options, you may choose to wire transfer money. Wire transfers are quick, cheap and will allow you to send money anywhere in the world - they are one of the best methods of international money transfer, and they often offer for the transfer money to be picked up the same day. Restrictions and fees may apply. Safe Deposit Boxes – Safe deposit boxes are a convenient place to store important items that would be difficult or impossible to replace. It also offers privacy (only you know what is inside) and security. Although many people like to keep valuables close by in a closet, safe or file cabinet at home or in the office, these places probably are not as resistant to fire, water or theft. Planters Bank offers a selection of sizes, prices and options to best suit your needs. Consult our nearest office for information on availability, restrictions and fees.